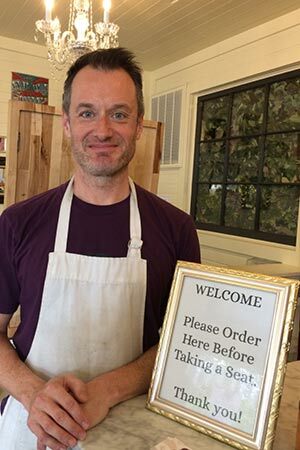 Sean Fredericks, co-owner of Kargi Gogo, offers Alberta Street diners authentic cuisine from Georgia – the country, not the state. Walk into Kargi Gogo and you’ll experience the warmth and charm of a Georgian home. That’s the country, not the state. Kargi Gogo opened July 18 in the former home of Big Egg at 3039 N.E. Alberta St. It’s the cheery yellow brickand-mortar iteration of a downtown food cart, which owners Sean Fredericks and McKinze Cook closed three years ago. Kargi Gogo literally translates to “good girl,” a term of endearment in Georgian, and the business’ cheerful girl logo embodies that. She tops the menu that offers items designed to please meat eaters, vegetarians, vegans and glutenfree diners. At its base, Kargi Gogo serves khachapuri – breads stuffed with cheese and other fillings, including one with an overeasy egg and butter – plus the pillowy, filled dumplings called khinkali. Also on the menu is another favorite of Sean’s, Georgian wine. “Much of it is made in large clay vessels buried underground, the same way it has been for 8,000 years. “We’re bringing wines to Portland that have never been here before and we’re always adding to our selection.” To see a sample menu for other Georgian treats, visit KargiGogo.com. Sean and McKinze know their Georgian food and wine. They served in the Peace Corps in Georgia from 2010 to 2012. “We fell in love with the food, but also the Georgian culture of hospitality and generosity,” Sean explained. “We knew we couldn’t get that food back in the states, so we came back and opened the food cart in 2013. Since closing the cart at the end of 2015, the couple sold Georgian spices online and cooked for a few events. They also traveled – including spending most of summer 2016 in Georgia – and pursued other interests. McKinze got a full-time job that she continues to enjoy, and Sean spent 2017 as a marketing consultant until he decided at the end of the year to open Kargi Gogo. “We’re trying to create the warmth of a typical Georgian home and, as soon as I saw the character and charm of this space, I knew it was perfect,” he said. He’s as pleased about the space. “It also has a large kitchen, which is helpful when making so much dough.